This most recent work in Paul Barker’s varied and extensive discography showcases a seasoned master of his craft who continues to fearlessly explore the outer limits of the sonishere. At times you get the impression that he is more of an aural director who’s dense soundscapes create an atmosphere that is as attractive as it is foreboding. He knows how to play the entire studio as an instrument and fearlessly applies his arsenal of effects (most likely his own Malekko pedals and rack modules) in unorthodox applications that are akin to a sonic minefield blowing off every recognizable appendage until the music takes on it’s own form to bend and morph in any way it wishes. Almost every track on the album features a different collaborator, some of which are familier cohorts such as Chris Connelly who’s heavenly, hypnotic croon perfectly floats on top of the bubbling, boiling surface of track Heavy Water that casts the listener out to beautiful uncharted territory. Longtime collaborator Nivek Ogre of Skinny Puppy fame delivers his signature cyborg-bullhorn issuing a chilling, cryptic message that incubates and oscillates in a sinister syncopation that could turn your veins into cables. New recruits include Taylor Momsen who’s sultry, cracking delivery on opening track Victory perfectly blends with Barker’s circular, undulating bass lines that work against backbeats and legato lashes of feedback laden guitars. Barker takes on vocal duties himself on Heroine’s Habit administering a pointed portrayal from an observatory perspective on music’s most destructive seductress. Dispersed throughout the album are guest mixes and tracks from the likes of Puscifer, Barker and Duane Denison’s Austin four-piece USSA and an arpeggiated interlude called Brudlefly by Jeffrey Kinnart. Though this is a soundtrack to accompany the documentary movie Fix (that follows Ministry on tour) with many different personalities and contributors there is a continuity and chemistry throughout each performance. In the wake of Paul Barker’s beautifully dark Flowering Blight album of 2009, we are assured that he continues to defy categorization and propel us forward, revealing new sounds and feelings that are both foreign and familier. It is rare that one has the courage to embrace new technology and fuse it so well with the human condition. 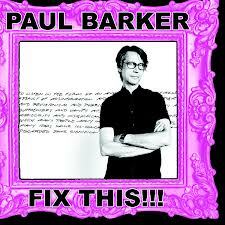 Like a musical Blade Runner, Paul Barker remains on the cutting edge.